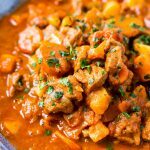 This Hungarian Goulash recipe is a rich and hearty dinner loaded with beef, carrots, potatoes, sweet paprika, and more. An easy stew recipe that reheats well and tastes delicious! Heat the vegetable oil in a large Dutch oven over medium-low heat. Add the cubes of meat to the pot and brown the outside, stirring occasionally. Once browned, add the onions and cook for another 3 to 4 minutes until the onion are translucent. Add the garlic and 1/4 cup of the paprika and cook for 1 more minute, stirring to combine. Add the remaining ingredients (except the vinegar) to the pot and simmer for 45 to 60 minutes, goulash is ready when the potatoes are tender. Remove bay leaf and add the vinegar, then season to taste with salt and pepper. 1/2 cup of Sweet Paprika is NOT a typo and is very necessary to the flavor profile of the dish. I know, my husband looked at me like I was crazy too when I told him to add it to the pot. But he's a big believer now! Remember, this is sweet paprika - not hot, smoked, or traditional. You can buy sweet paprika here. The key to this recipe, as my great-grandfather always said was that the meat and vegetables be diced really small. This recipe can either be more like a soup or more like a stew, this recipe is more like a stew because the starch from the potatoes helps to thicken the liquid. You can add more beef broth or water if you want it to be more like a soup. You should make sure that the broth covers all of the other ingredients, I recommend starting with 4 cups and adding more if needed.